True story: when it was announced that The Rolling Stones planned to bring the Steel Wheels tour to my home town, I drew the short straw to get tickets. Now, this happened way before the Internet and refreshing Web pages on LiveNation to get good seats. I had to drive to Turtles Records and Tapes about an hour before the sale began and pluck a strip of paper from a hat as part of the “lottery” system. There were rules, too: you entered the store when your number was called, and you took the tickets they gave you. Fine. We all thought this was the Last. Stones. Tour. Ever. I’d play ball. As my number is called and I’m walking toward the store, this guy stops me. Would I buy three more tickets for him and his friends. A store clerk sees this and says, “Do you know him? You can only buy your tickets. No cuts.” You have to understand I was a good Catholic teenager who couldn’t deceive anybody. Catch me in crosshairs and I start blubbering. At the same time, I’m thinking this stranger is about to screw up my only chance to see the Stones. My memory is blurry, but somehow I managed to get past the checkpoint and buy six tickets. The show sold out in about a week. We sat in the boonies and loved it, because we thought these guys were winding down and would, contrary to a song they covered, fade away. 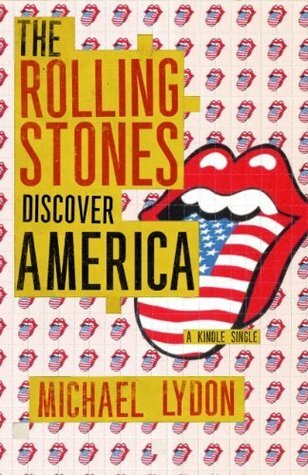 As I’m reading The Rolling Stones Discover America, I experience a touch of deja vu, even though this Kindle single recounts an earlier tour of America. After a long hiatus from the road, the band has decided to resume live shows, and the reaction is similar to the Steel Wheels frenzy. I imagine many fans scrambling to see the 1970 tour figured it was a brief gift before an eternal exile to the studio, a la The Beatles. Rock journalist Lydon covers the journey in Discover, a longish essay that paints vivid pictures of the people and places along this journey. It reads like a series from Rolling Stone Magazine, too, which makes sense as Lydon was a founding editor. The further you read into Discover, you may think the real story lies in the periphery of the band – the fans, the media, the family, and the gofers and manager who orbit the group. Names are dropped, and some snippits of conversation provide amusement – like when Keith Richards predicts nobody in the band will get an MBE like John Lennon (no, but Mick would be knighted). You’ll read a line about Janis Joplin and Tina Turner hanging out after a show and wish for more details. When you first get into the chapter on Altamont, you get the impression people sensed the show was doomed. And just as quickly as the action happened there, so it is as quickly retold. This is a quick read, not necessarily about The Rolling Stones but the climate in which they existed – a time in music where bands and listeners straddled the fine line between mop-top innocence and free-love hippiedom. It is a prelude to future explosions – civil rights movements, Vietnam, etc. It’s certainly not meant to be a definitive story on the Stones, but it makes an interesting chapter in their careers worth reading. Kathryn Lively is a mystery author and book blogger.